I hope you had a great weekend! I wanted to quickly update my blog with these reviews since I can see that a lot of you are checking out my reviews. Thank you so much for shopping via my links during this LOFT Cyber Spring sale while everything is 50% off (or extra 10% off if you received the mobile text alert) and ships for free. Use code CYBER. The sale ends tomorrow Monday, April 1, 2019 at 11:59PM ET so unless they extend this sale it will not overlap with the Tuesday extra 15% off discount. Refer to all of my LOFT reviews here. If you’re shopping the surprise deals you can use code MOBILE25 for an extra $25 off your full-price promotional purchase of $100+. However, you will not be able to get free shipping unless you use code CYBER but the shopping cart only accepts one code at checkout. You could chance placing an order for in store pick up to save on the shipping fee but the in-store inventory is not guaranteed. You can also check out my recent purchases here. I placed a massive online order so that I can decide which items I like best and a lot of what I wanted were in the sneak preview section. April try-ons and reviews should be very interesting so stay tuned! For size reference I’m 5′ 2.5″ and currently 110 pounds. I’m usually size XS petite in tops and 0/25 petite in pants and jeans. 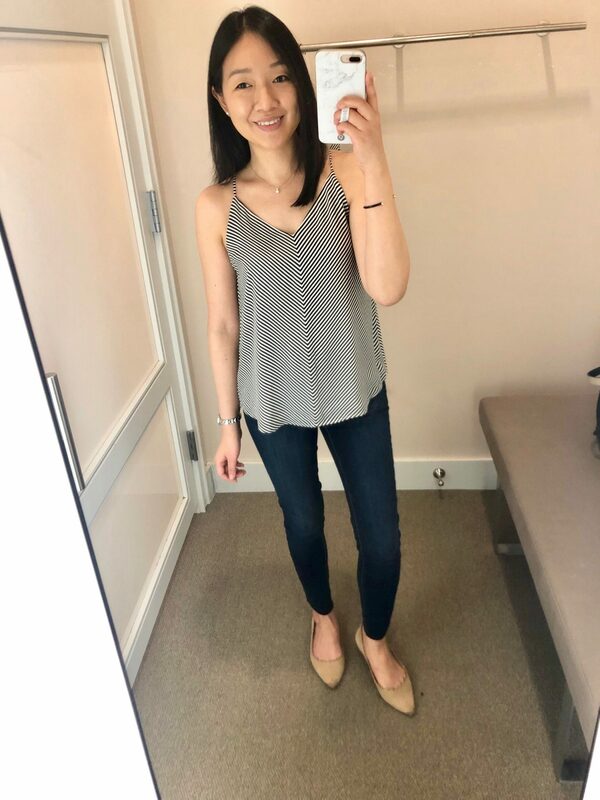 If you’re new to my blog I typically share the link to a short video clip below each image (the same video clips I share in my Instagram stories swipe ups during sales). My Pinterest is also update to date if you prefer a more visual catalog of my reviews. You can also check out my other reviews organized by retailer here. I stopped by in stores today and found this hoodie to try on in size XXSP which was a big snug in the sleeves. I’m glad I ordered this one in XSP after ordering XXS regular over a week ago (review here). 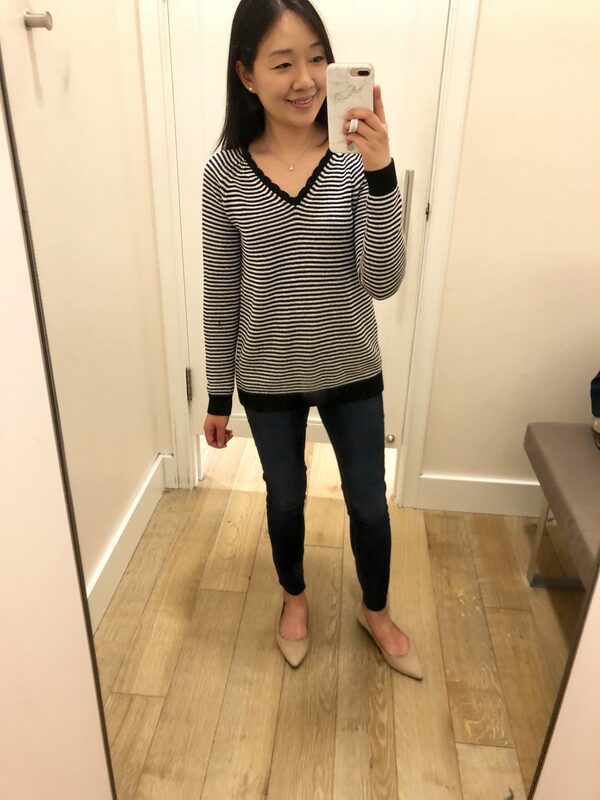 Note that I cut my jeans to a 26″ inseam since they were originally too long on me (as seen in my sponsored post with Walmart here). 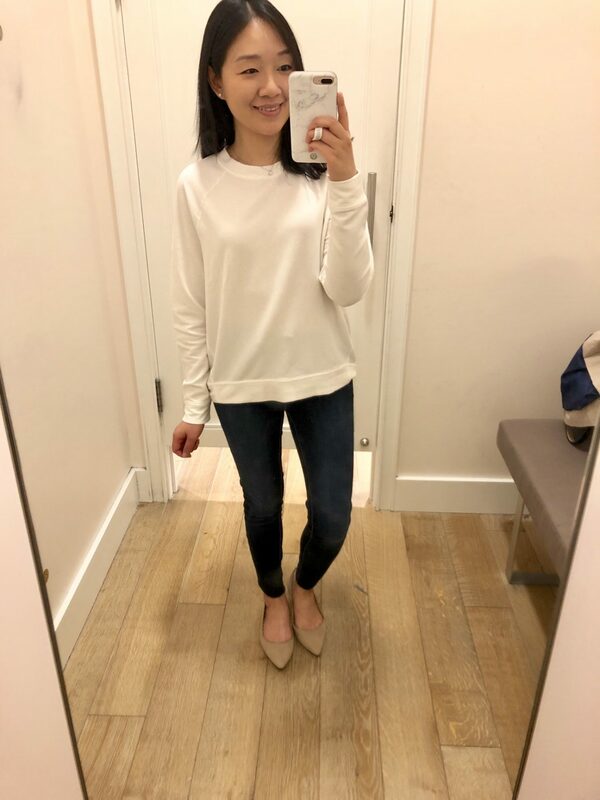 This white sweater is really cute but it has a very loose fit so I would have preferred XXS regular but my preferred size is sold out online. The signaturesoft material is really soft but sometimes it can pill from rubbing against your purse. If you love white tops you may not be able to resist trying this light sweatshirt. Size XS is 23″ total length in the front and 25.5″ total length in the back. 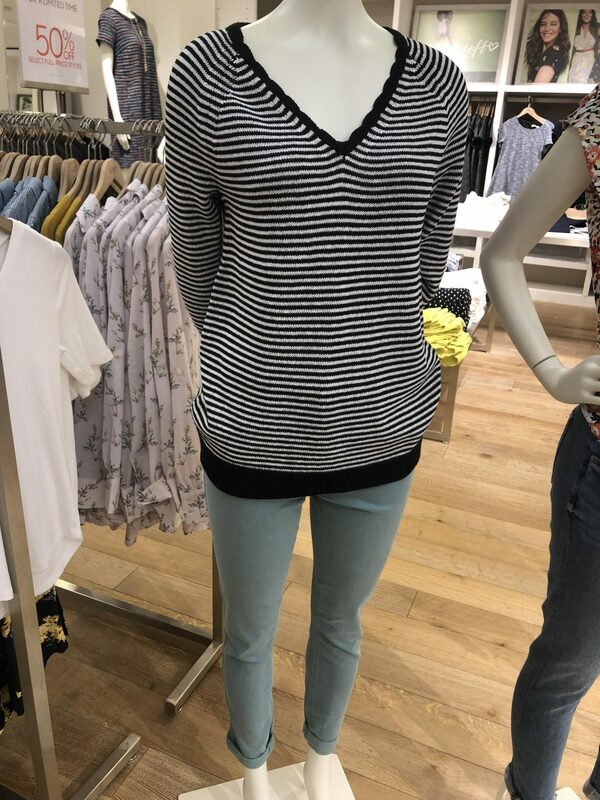 This striped sweater looked so cute on the mannequin and I love the scallop detail at the neckline. 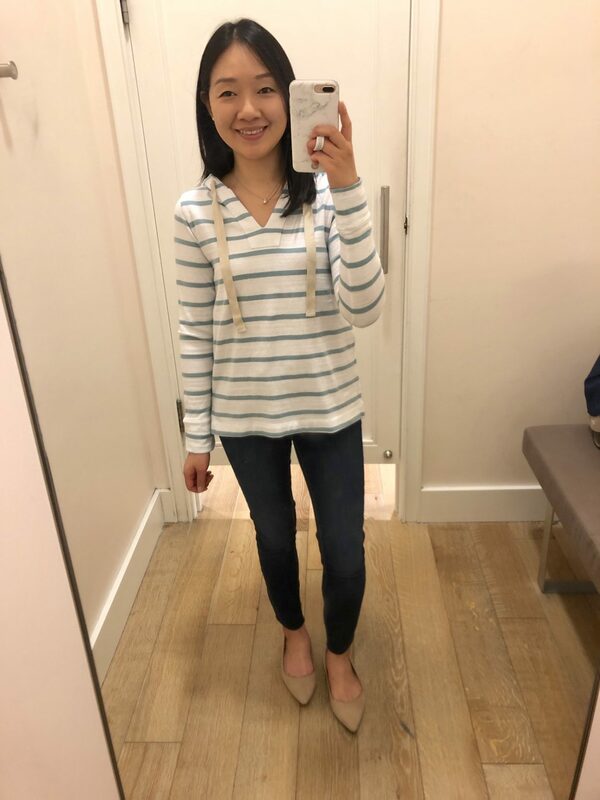 I grabbed size XS regular to try on and it’s a relaxed fit on me. I measured it at 24.75″ total length which is a bit longer than what I prefer and it doesn’t come in petites. 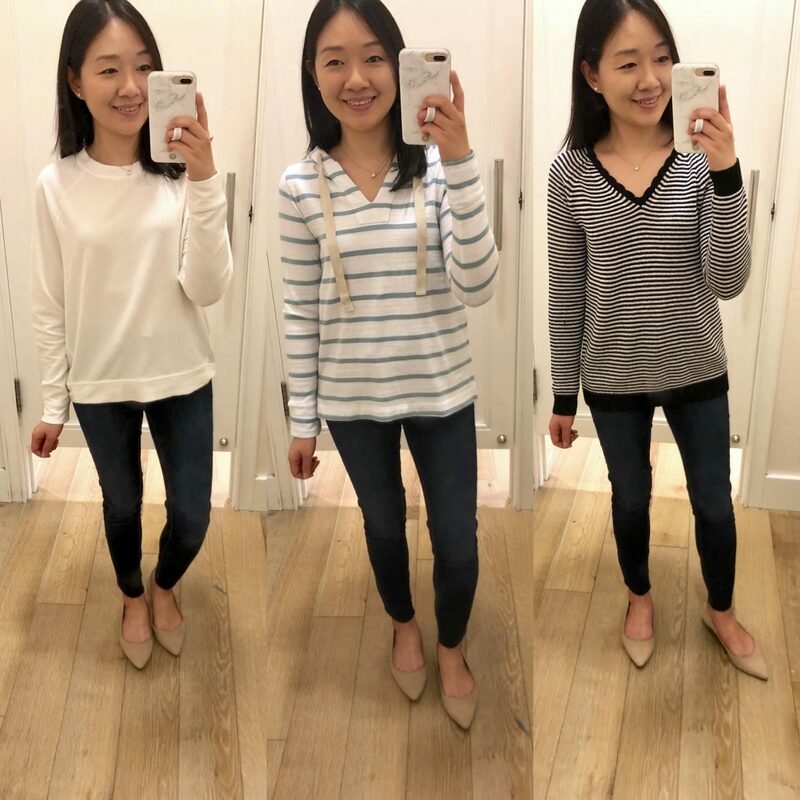 I usually prefer sweaters between 23-24″. In store they paired this sweater with what looks like these frayed hem skinny crop jeans in misty fog cuffed. This strappy cami is so cute with the micro stripes and it comes in many color and prints here with and without the button details. My usual size XSP fit me well but I wish I could wear this style with a regular bra. It’s double lined so it’s not too sheer. Lastly, get 60% off select full-price styles and get an extra 60% off sale styles at Ann Taylor. Use code SURPRISE. Sale ends 4/2 at 12 midnight ET. Also get 40% off select full-price tops and sweaters and since no code is needed on select items as marked in these two categories you can use code THANKS7 for an extra $50 off your full-price promotional purchase of $100+. I ordered a few tops that were 40% off and then with the extra savings it came out to be about 70% off retail. Shipping Tip: Use the ShopRunner shipping option for free 2-day shipping on orders of $25+. Refer to all of my Ann Taylor reviews here. As always I highlighted my favorite sales picks over on my Insta Shop which I update between blog posts.